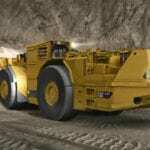 Caterpillar has revealed that its first battery electric load-haul-dump (LHD) platform will be the Cat R1700 underground mining loader. Building on the R1700’s initial introduction in 2018, the R1700 XE will add a lithium-ion battery operating and charging system developed in-house by Caterpillar. Cat’s MEC 500 fast charging system can charge the R1700 EX “with little or no impact to the mine’s existing electrical infrastructure”, according to Caterpillar. “The Cat charging system eliminates both the hazards of battery handling during recharging and the necessity to maintain change-out battery inventories,” the company added. The R1700 XE incorporates the benefits of the R1700’s improved digging performance over its predecessors, including its fuel-saving electrohydraulic system. It also incorporates over 350 patents from other machines in the company’s fleet. 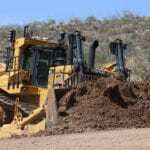 Caterpillar developed a proof-of-concept machine to prove the battery’s viability for underground mining environments by converting a diesel Cat R1300 LHD to a battery electric vehicle while concurrently developing its MEC 500 charging system. The systems were tested at the company’s Peoria proving grounds in Illinois, United States, followed by extensive testing at an underground mine in Canada. The battery-powered R1300 LHD was found to have exhibited a tenfold decrease in energy costs when compared with the diesel-powered model, while also producing less noise, reducing tyre wear and exhibiting several other benefits. 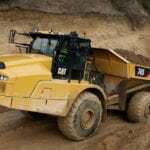 “Caterpillar has used the insight gained from its proof of concept testing to develop the R1700 XE and the MEC 500 charging system as a safe and productive option for mines going to battery electric fleets,” the company concluded.